On the weekend I went shopping in the McArthur Glen outlet shopping centre in South Wales, I always go when we go to visit my grandparents and normally end up buying more than I should. 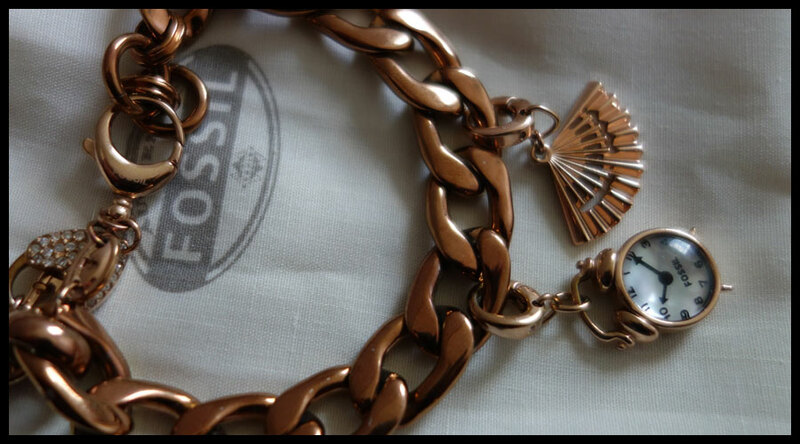 The past few years I’ve been buying things from the Fossil store there, I have a silver necklace that charms clip onto and a rose gold coloured bracelet that at the moment has one clock charm on it. I normally go in to see what they have as the offers are so good. I ended up buying three charms, two silver and one rose gold, and a pair of earrings. The earrings weren’t something I was planning on getting as I haven’t seen any of theirs that I’ve wanted in their outlet store before but they just seemed so ‘me’ and I loved them as soon as I saw them. 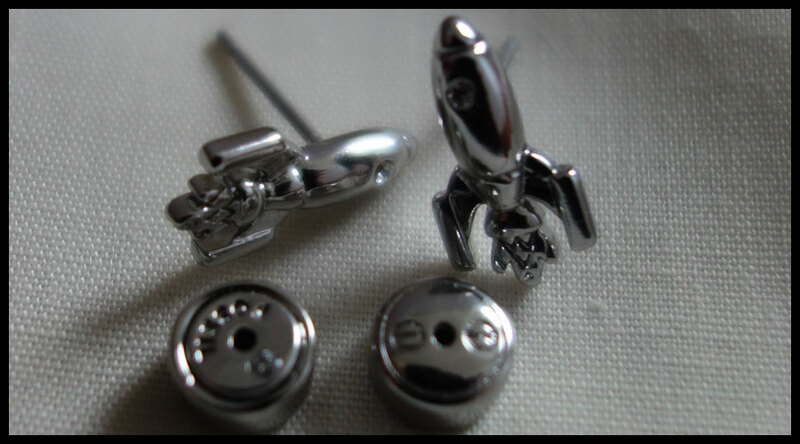 I’ve had a bit of a sort out of stud earrings recently and wanted to get some new ones to replace the cheap ones I’d got rid of so they weren’t too much of an impulse buy, at least that’s what I’m telling myself! This weekend the charms were all £6.99 and all jewellery had 30% off as well so they were £4.90 each, as there were three I wanted the offer seemed too good to miss especially as one was a charm I’ve had on my ‘want to get’ list for the past year but I could only find it o eBay from the USA so the price of the charm wasn’t too bad but the postage put it way above what I wanted to spend. 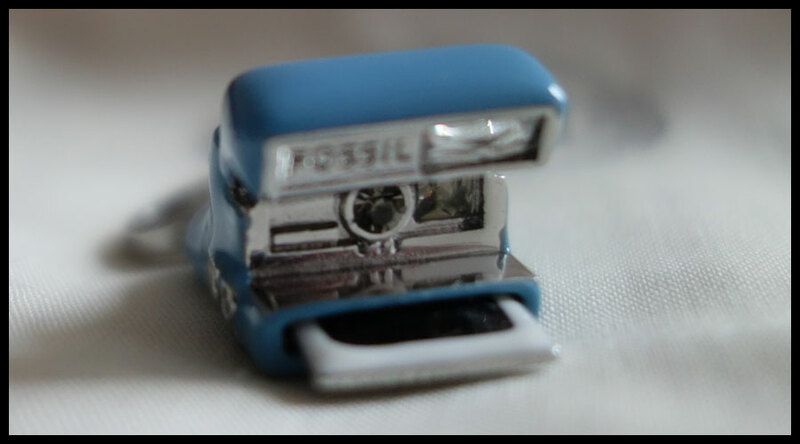 The charm I’ve wanted most was the polaroid camera charm, I already have a more modern camera one as I love photography but I saw this over a year ago and loved the look of it. 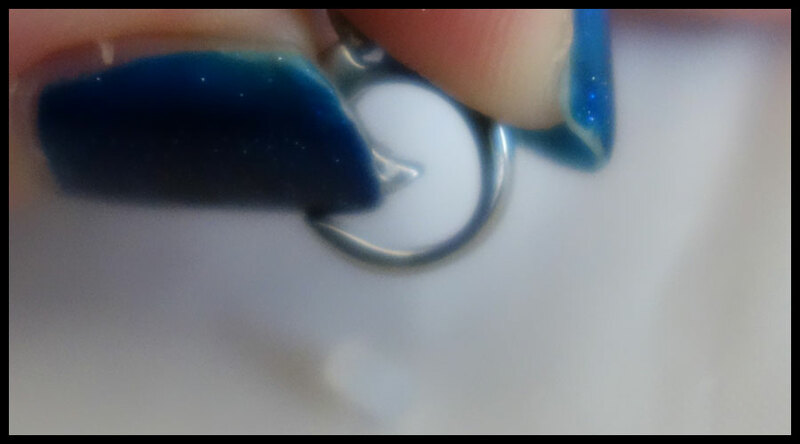 The main part is solid metal with a blue enamel on it, it has a few clear gems or cut glass, I’m not sure which, that are used for details like the flash and lens. The polaroid photograph itself is metal with white and black enamel on it and it is a bit loose so can move in and out though can’t be removed completely from the camera. There is the Fossil name on the front, next to the flash, though it isn’t so obvious that you can notice it without knowing it’s there or looking closely. 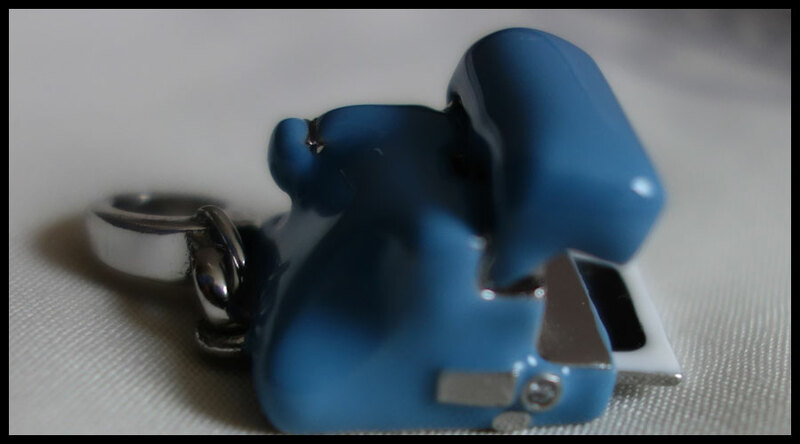 Overall I really like the look of this charm, the shape is distinctive and very obviously a polaroid and it’s got a fair amount of detail on it for something the size that it is. As with all Fossil charms it has a good weight to it, you can feel it in your hand and feels sturdy, as if it will survive well and not lose the enamel or get knocked around too easily. On the price label for this it says £19.99, though I think this may be the price when sold at the outlet store, I can’t find it for sale anywhere besides second hand so not sure on its recommended price, either way at £4.90 it was less than 25% of the original price which seemed like a great price to me. The clasp is a simple and fairly standard clip that can be easily opened and opens wide enough to fit onto any of the accessories it is designed for. These also work well on the end of chains that aren’t from the company, though they do need to have a certain size to the chain for it not to look out of place as the clasp and charm itself are fairly big, though this does vary depending on the design. The clasps for each of the charms have the Fossil brand down the side though this one has the print larger and does not have the small piece of cut glass or gem that the other two I bought do. I think it may depend on the age of the design though I’m not sure as I’ve bought both versions in the past, the ones with the larger Fossil and no gem seem to be the harder to find ones and therefore I’d think they were older. I haven’t found a database that says when each was released to check though. 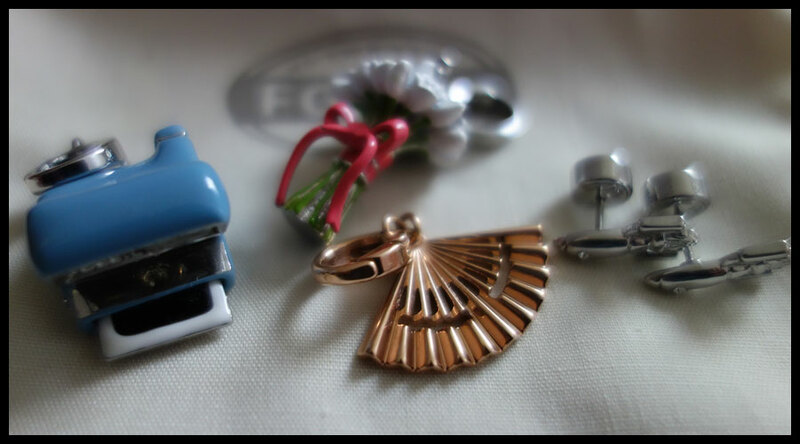 The second charm I decided to get was the rose gold fan, I have had the bracelet for a couple of years now and I haven’t seen many rose gold charms to go on it from Fossil. Most often the ones I’ve seen are the baby boot one though I’m definitely looking out for the masquerade mask one. 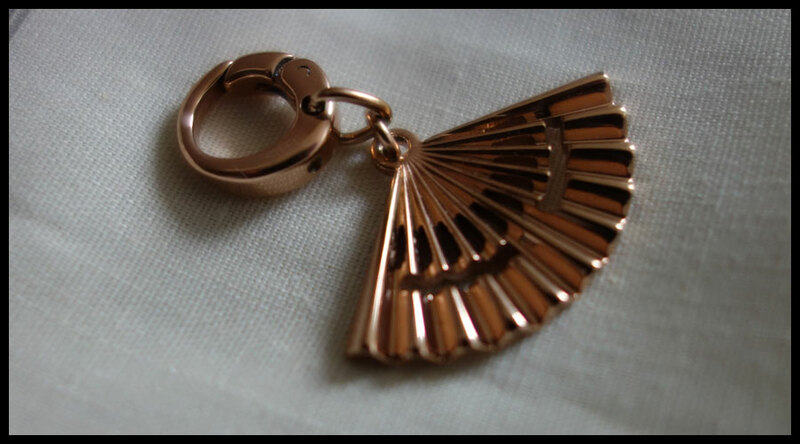 I like the fan design, it’s simple though I didn’t have a particular r eason for choosing the fan, unlike the camera, I just thought it was a nice design that goes well on my bracelet. The charm is thinner and lighter than the camera due to the design but still has a thickness that makes it feel like it would survive being worn on a bracelet without worrying about it getting accidentally knocked a bit. This charm had a price of £19.00 on the label though again I’m unsure if this is full price though looking on the website I’d say for the simplicity of this design it probably was. 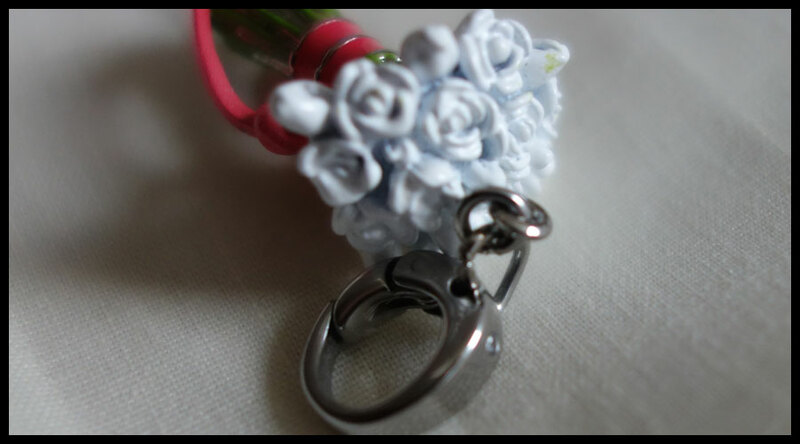 The final charm was a bouquet of flowers. This is another that I don’t have a particular connection with but I love the detail on it. I’ve seen it the past couple of times I’ve been and liked it but the price wasn’t as good and there were others I preferred so I went for them but with the price going down I decided I’d get it this time. I have recently started wearing more floral things in the summer and spring and thought this would be nice to go on the long necklace I have to go with those outfits. 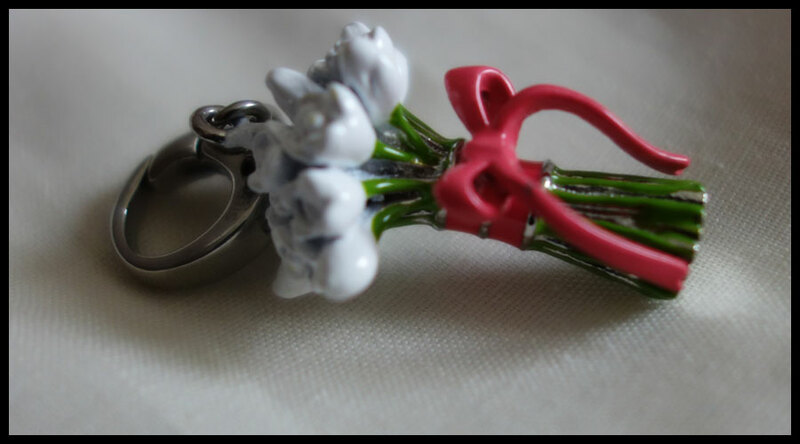 It’s a solid metal design, like the camera, and has white and green enamel for the flowers themselves and pink on the ribbon that is tied around them. I love the detail, especially on the flower heads themselves, and the colours chosen go really well for me. They’re the kind of colours that could go with almost anything, they’re just nice bright spring or summer time colours. I think I would have bought it sooner if the ribbon hadn’t been pink, I’m not a huge fan of pink myself but I think it works on this. Being solid metal it’s fairly heavy though not as heavy as the camera. 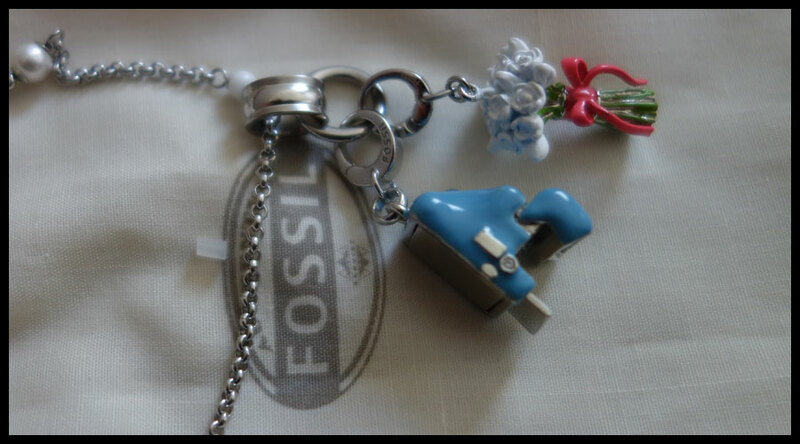 This charm was marked as £25.00 which I think was the original price in stores rather than the outlet. These were the earrings I saw and loved as soon as I saw them, I didn’t see any others like it there so I’m not sure if they were the end of a line but I can’t find them on their site either. They were marked as £15.99 so I paid £11.89 which seems a good price for them to me. The design is a simple rocket, the kind you see in cartoon drawings, with a small stone or cut glass in the part where the window would often be. I like the small detail in the flames, the pattern is imprinted on them though it isn’t that obvious unless you look. I didn’t realise the detail on the earrings until I got home and took these photographs, the detail on the backs surprised me as that part isn’t really seen and almost all of the other pairs I have use the normal butterfly backs whether they were more or less expensive than these. The one side has the Fossil and small gem that the clasp of the two charms has and the other has the imprinted outline of what looks like two screws. The side with the two screws is supposed to go against the ear so you don’t actually see it. When I look closer it might be that there are two or three pieces that make up the earrings as there is the front and back of this back and what feels like a piece of rubber inside that grips the post to hold it in place, I’m not going to try and check though. They feel really comfortable and the back is easy to slide on and off the post but feels like it has enough grip to hold it in place while wearing without worrying about them falling off. Overall I’m very happy with these purchases, especially the charms at the price they were. I have had my necklace and bracelet for a couple of years now, I think the necklace maybe three, and the previous charms I’ve had have survived well and not shown any wear on them. I love how easy it is to swap them out, especially the silver ones on the necklace I have. 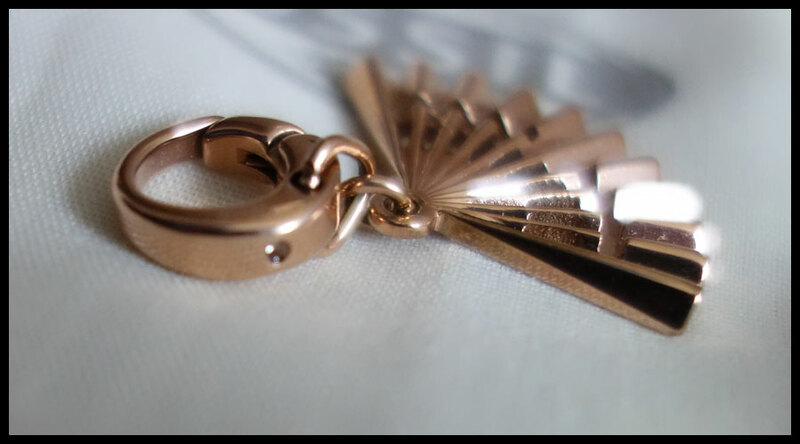 Though the bracelet I have my rose gold ones on does require a bit of wiggling as I’m not sure if it was designed for them, the only place you can get the charms on is by moving them to the part where the two links overlap as it’s half the thickness of the rest. I’m not sure the charms would be worth the full price to me, maybe the camera if £19.99 was its original price, but th ey’re definitely worth the prices that you pay in the outlet shop. I do love these charms and they seem to survive well so maybe they are worth it, I might have been willing to pay it if I didn’t know somewhere to get them for less. I guess it all comes down to what you’re willing to pay for these, some of the designs I’ve found while looking on the website for these prices I would possibly pay full price for but I might risk it and see if they ever pop up in the outlet store.